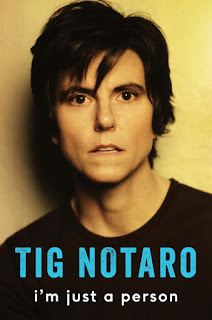 I have loved Tig Notaro since I clicked on her first album one night before bed while browsing Spotify and proceeded to laugh until my stomach cramped. Then, of course, her 'Live' album was released and that was a huge deal, and thank God more people know about her now. Have you seen her just push a stool around a stage for an uncomfortably long period of time? The things she does with comedy contribute to it as an actual art form, and I am unbelievably impressed with her. So she wrote a book. That's cool. Lots of comedians writing books these days. It's not a funny book though, because it deals with her terrible terrible four month period that's described in Live. It's basically Live, but much more detailed. It's pretty short. It makes you think about life. It's probably more meaningful if you've suffered a recent loss, or dealt with anything pretty traumatic, which KNOCK ON ALL THE WOOD IN THE LAND, I've been spared from for quite some time. As with most other books by comedians, I feel like I'm Just a Person is probably better as an audiobook. Tig's delivery is so uniquely her -- I can absolutely see this being really really compelling with her just telling you the story instead of reading flat words on a page. For those of you who don't know, Tig went from getting very sick, going to the hospital, getting C. diff (which is basically a bacteria eating your intestines), having her mother suddenly die, going through a breakup, and then finding out she had cancer. In four months. So the book is mainly what her feelings were during it, how she dealt with it. Which is interesting, right? People like seeing what other people do in times of intense tragedy so we can maybe feel like we know what to do during those times. "Then I went through a breakup. Right in the middle of it all. It's tough times. Can't stick around for that. Gotta get out before the cancer comes." See how they would think that? I'm just saying. Because in your book, when you said it was mutual, it was a total surprise to me because in your show you said that thing. That made it sound not mutual. Just saying. 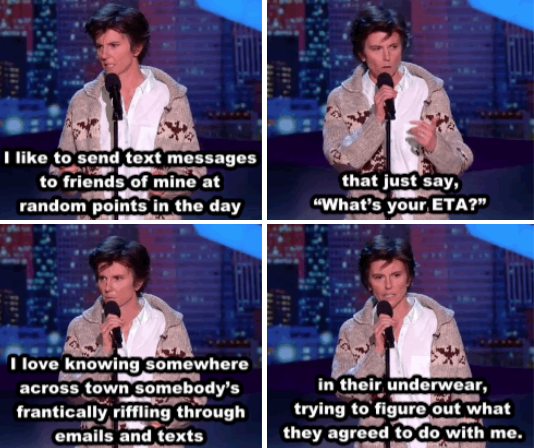 ANYWAY, Tig Notaro is a great comedian. She went through some terrible things. She has this book. It has sad things. Probably look for the audiobook. And listen to all her albums.